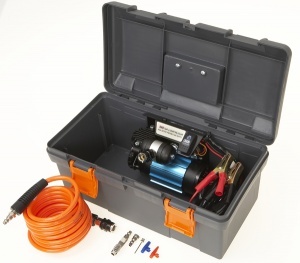 ARB High Output Portable Air Compressor Engineered to suit any off road adventure, this portable air compressor has been constructed entirely of lightweight, high grade meterials and is mounted in a durable case offering easy carrying and storage. It features a hard anodised cylinder bore and a Teflon impregnated carbon fibre piston seal for reduced friction and maximum trouble free life. Coming with a 6 metre air hose and battery clips, the kit includes all the necessary fittings to inflate tyres and camping or leisure gear.